Perfect for a Halloween get together, an appetizer that's gross to look at - but so tasty to eat!! 1. In a medium sauce pan, saute onion and garlic in the olive oil till softened but not brown. 2. Add beans, bacon crumbles, taco seasoning, cheese and sour cream. Heat till cheese is melted through. 3. 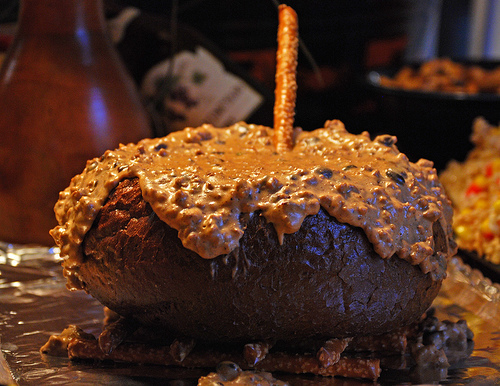 Hollow out and over-fill a pumpernickel Crusty Bread bowl. Serve with the bread pieces, pretzel rods, tortilla chips, +/or carrots & celery.